On the NAO Blog: WannaCry: what does it mean for government? On Friday 12 May 2017 a computer virus, known as WannaCry, which encrypts data on infected computers and demands a ransom payment to allow users access, was released worldwide. WannaCry was the largest cyber attack to affect the NHS in England, although individual trusts had been attacked before 12 May. The National Audit Office investigation focused on the ransomware attack’s impact on the NHS and its patients; why some parts of the NHS were affected; and how the Department and NHS national bodies responded to the attack. The Department was warned about the risks of cyber attacks on the NHS a year before WannaCry and although it had work underway it did not formally respond with a written report until July 2017. The Department and Cabinet Office wrote to trusts in 2014, saying it was essential they had “robust plans” to migrate away from old software, such as Windows XP by April 2015. In March and April 2017, NHS Digital had issued critical alerts warning organisations to patch their systems to prevent WannaCry. However, before 12 May 2017, the Department had no formal mechanism for assessing whether local NHS organisations had complied with their advice and guidance and whether they were prepared for a cyber attack. 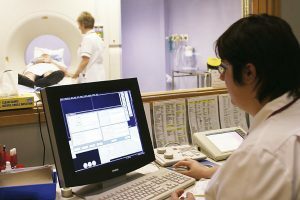 The attack led to disruption in at least 34% of trusts in England although the Department and NHS England do not know the full extent of the disruption. On 12 May, NHS England initially identified 45 NHS organisations including 37 trusts that had been infected by the WannaCry ransomware. In total at least 81 out of 236 trusts across England were affected. A further 603 primary care and other NHS organisations were infected by WannaCry, including 595 GP practices. However, the Department does not know how many NHS organisations could not access records or receive information, because they shared data or systems with an infected trust. NHS Digital told us that it believes no patient data were compromised or stolen. Thousands of appointments and operations were cancelled and in five areas patients had to travel further to accident and emergency departments. Between 12 and 18 May, NHS England collected some information on cancelled appointments, to help it manage the incident, but this did not include all types of appointment. NHS England identified 6,912 appointments had been cancelled, and estimated over 19,000 appointments would have been cancelled in total. Neither the Department nor NHS England know how many GP appointments were cancelled, or how many ambulances and patients were diverted from the five accident and emergency departments that were unable to treat some patients. The Department, NHS England and the National Crime Agency told us that no NHS organisation paid the ransom, but the Department does not know how much the disruption to services cost the NHS. Costs included cancelled appointments; additional IT support provided by NHS local bodies, or IT consultants; or the cost of restoring data and systems affected by the attack. National and local NHS staff worked overtime including over the weekend of 13 to 14 May to resolve problems and to prevent a fresh wave of organisations being affected by WannaCry on Monday 15 May. The cyber attack could have caused more disruption if it had not been stopped by a cyber researcher activating a ‘kill switch’ so that WannaCry stopped locking devices. Between 15 May and mid-September NHS Digital and NHS England identified a further 92 organisations, including 21 trusts, as contacting the WannaCry domain, though some of these may have been contacting the domain as part of their cyber security activity. Of the 37 trusts infected and locked out of devices, 32 were located in the North NHS Region and the Midlands & East NHS region. NHS England believe more organisations were infected in these regions because they were hit early on 12 May before the WannaCry ‘kill switch’ was activated. The Department had developed a plan, which included roles and responsibilities of national and local organisations for responding to an attack, but had not tested the plan at a local level. As the NHS had not rehearsed for a national cyber attack it was not immediately clear who should lead the response and there were problems with communications. Many local organisations could not communicate with national NHS bodies by email as they had been infected by WannaCry or had shut down their email systems as a precaution, though NHS Improvement did communicate with trusts’ Chief Executive Officers by telephone. Locally NHS staff shared information through personal mobile devices, including using the encrypted WhatsApp application. NHS England initially focused on maintaining emergency care. Since the attack occurred on a Friday it caused minimal disruption to primary care services, which tend to be closed over the weekend. Twenty-two of the 27 infected acute trusts managed to continue treating urgent and emergency patients throughout the weekend. However, five, in London, Essex, Hertfordshire, Hampshire and Cumbria had to divert patients to other Accident and Emergency departments, and a further two needed outside help to continue treating patients. By 16 May only two hospitals were still diverting patients. The recovery was helped by the work of the cyber security researcher that stopped WannaCry spreading. NHS Digital told us that all organisations infected by WannaCry shared the same vulnerability and could have taken relatively simple action to protect themselves. Infected organisations had unpatched, or unsupported Windows operating systems so were susceptible to the ransomware. However, whether organisations had patched their systems or not, taking action to manage their firewalls facing the internet would have guarded organisations against infection. The NHS has accepted that there are lessons to learn from WannaCry and is taking action. NHS England and NHS Improvement have written to every major health body asking boards to ensure that they have implemented all alerts issued by NHS Digital between March and May 2017 and taken essential action taken to secure local firewalls.